Gift Certificates are the perfect gift for anyone who enjoys a ghost hunt. Gift certificates are valid for a full year from the time of purchase only. Please keep safe as misplaced Gift Certificates cannot be re issued. If unused we cannot offer any exchanges or extended dates we are sorry. All gift vouchers are posted to you first class the next working day of purchase. 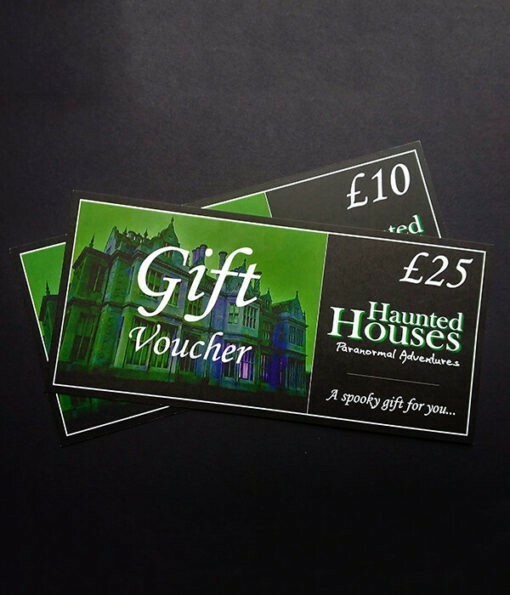 Each Haunted Houses gift voucher has a unique code for the relevant value as displayed on each card. Simply enter this code into your coupon box when making your purchase via the shopping cart, you will then receive the relevant discount to match the card value. Any outstanding fees are required to be paid at the time of the booking in order to complete the purchase. We cannot offer any credit for any overspends on gift vouchers sorry. Please note: If a Gift Certificate is not entered correctly at the time of purchase, once an order has been completed, unfortunately we will not be able to add the Gift Certificate to an order once it has been processed.